Corendon to put Boeing 747 in hotel garden! Travel agency, airline company and hotelier Corendon is having a complete Boeing 747-400 transported from Schiphol airport to its Corendon Village Hotel in Amsterdam this month. The retired plane is set to take up residence in the hotel’s garden, but its short journey from the airport will take rather longer than one of its long-haul flights. Dutch transport specialist Mammoet will transport the 150-ton plane from the airport to the hotel over five days, starting on Tuesday 5 February. During its spectacular last journey, the aircraft will have to cross 17 ditches, highway A9 and one provincial road. The Boeing 747 is the former KLM aircraft ‘City of Bangkok’ that will be given a new final destination after 30 years of reliable service. In recent weeks it has been painted in the colours of Corendon in Rome. The jet has also been stripped of all its serviceable parts, including the engines, by aircraft recycling company AELS. 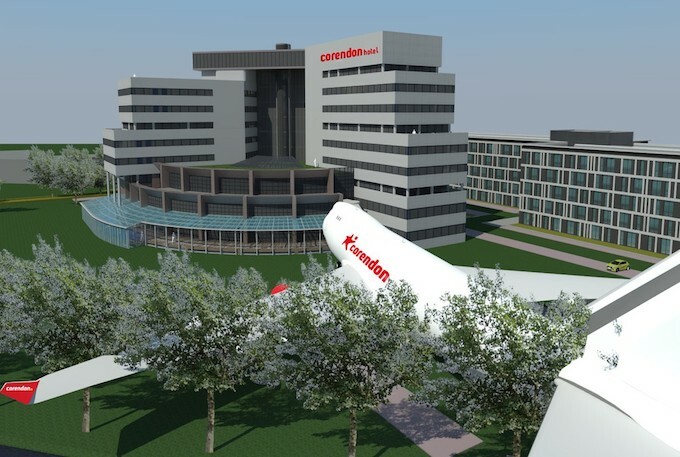 After the transport the plane will be placed in the garden of the Corendon Village Hotel Amsterdam, and converted into the Corendon Boeing 747 Experience, which will open its doors in the third quarter of 2019. The hotel opened last year in the former headquarters of Sony. With more than 680 rooms, suites and apartments it is the largest hotel in the Benelux. Guests have a clear view of Schiphol Airport. Tuesday 5 February 22.00 hours – Wednesday 6 February 07.00 hours: On Tuesday, February 5th, at 11pm the aircraft will roll on a self-propelled trailer of transport giant Mammoet, crossing Schiphol Airport. It will leave the airport site via the Zwanenburgbaan and be transported over the meadows towards the Sloterweg, where it will stay for two days. The most spectacular part of the transport is the crossing of highway A9. This will happen during the night of Friday 8 and Saturday 9 February. After that the aircraft will follow its route towards the Corendon Village Hotel. Saturday 9 February 00.00 hours – Sunday 10 February 04.00 hours: The aircraft will cross the Schipholweg during the night of Saturday 9 to Sunday 10 February and make 57 traffic movements before it takes its place in the garden of the Corendon Village Hotel.